Posted by Ezra Resnick in Ethics, Evolution, Religion. In fact, the most sensible and logically consistent outgrowth of the atheist worldview should be permission to get for one’s self whatever one’s heart desires at any moment (assuming that you can get away with it). Why not have that affair? Why not take a few bucks from the Alzheimer victim’s purse — as it can not possibly have any meaning either way. Did not Richard Dawkins teach us that selfishness was built into our very genes? To live a “moral” life, the atheist must choose to live a willful illusion as the true nature of the world contains, as Dawkins suggests, “no design, no purpose, no evil, no good, nothing but pitiless indifference.” It boggles the mind how anyone with this worldview even bothers to get up in the morning only to suffer through another bleak and meaningless day. I am not advocating a morality based on evolution. I am saying how things have evolved… I stress this, because I know I am in danger of being misunderstood by those people, all too numerous, who cannot distinguish a statement of belief in what is the case from an advocacy of what ought to be the case… If you would extract a moral from [this book], read it as a warning. Be warned that if you wish, as I do, to build a society in which individuals cooperate generously and unselfishly towards a common good, you can expect little help from biological nature… Let us understand what our own selfish genes are up to, because we may then at least have the chance to upset their designs, something that no other species has ever aspired to. Some of us, who prefer not to “live a willful illusion,” begin by trying to understand what is true about our world, and then we deal with reality as it is. The rabbi’s feeling that life would be “bleak and meaningless” if we aren’t part of some grand cosmic plan says absolutely nothing about whether such a plan really exists. But why would anyone think that the lack of an ultimate purpose in nature makes our lives meaningless? We are conscious beings, capable of appreciating our amazing good fortune in having the opportunity to live in this awe-inspiring universe. We can cooperate with each other in order to achieve far more than we could on our own, leaving the fruits of our efforts for future generations to enjoy and improve upon. We have the ability to understand the consequences of our actions on the happiness and suffering of ourselves and of others. So what truly boggles the mind is Jacobs’ implying that the only reason to refrain from cheating and stealing is because God said so. Again, Jacobs is confusing what natural selection cares about (reproductive fitness) with what we ought to care about. But the irony here is simply breathtaking: it’s the secular worldview that is racist, while the theistic is not!? The Bible repeatedly and unequivocally supports slavery, tribalism and discrimination, and commands the destruction of entire nations including women and children. The idea that all people have intrinsic value and ought to be treated equally — regardless of race, gender, or religion — is a modern, secular value, resisted mightily (to this day) by traditional religion. Of course, the rabbi realizes that nonreligious people are not in fact more likely to behave immorally than the religious. How does he explain the observation that most of the atheists he has met are actually “very good people”? At the end of the day, the reason that I can agree with many of the moral assertions that these atheists make is because they are not truly outgrowths of their purported philosophies, but rather of mine. I would suspect that the great majority of the atheistic understanding of morality comes directly or indirectly from what is commonly referred to as the Judeo-Christian ethic. Seriously!? What about all the Hindus, Buddhists, Jains, etc. — how did they ever figure out not to steal and murder without Yahweh telling them so? And what about all those Judeo-Christian pearls of ethical wisdom that the rabbi simply ignores, like executing homosexuals, women who are not virgins on their wedding night, and disobedient children? If Jacobs were not so arrogant and ignorant, he would realize that whatever parts of his own ethics are defensible are products of human rationality and secular thinking. And if he cares more about obeying the purported will of God than about the actual well-being of people in this world, then his morality is a disgrace, and he might stand to learn a few things from some atheists. Posted by Ezra Resnick in Game theory. You have until the next morning to make your decision. Before you are taken away, though, you see the tyrant whispering something into your sweetheart’s ear. Later, in your cell, you ask her what he said. Your sweetheart looks into your eyes, and tells you that the tyrant promised he would play Death. If the tyrant is to be believed (and he is known for being an honest tyrant), this is good news, because then you can save both yourself and your sweetheart by playing Life. Your sweetheart encourages you to do so. So what would you do? Life or Death? Posted by Ezra Resnick in Logic, Philosophy, Religion. The point is that ‘god’ is not like ‘ether’ — it is not amenable to empirical investigation, and does not occupy a slot in some systematic framework of thinking about the world that might be improved on in the light of better theory or observation. It does no work because it purportedly does all work; like a contradiction it entails anything whatever; it is consistent with all evidence and none. These considerations constitute the proof that it is an empty concept. — If you treat the word ‘god’ as a name for a putative entity that might or might not exist and such that something might count as evidence for or against its existence, as you do, then you are committed to agnosticism about everything that can be given an apparent name. But ‘god’ is not like ‘yeti’ (which might — so to say: yet? — be found romping about the Himalayas), it is like ‘square circle’. Trying to explain to someone who thinks that ‘god’ is like ‘yeti’ (namely, you) let alone to someone who thinks ‘god’ is like ‘Barack Obama’ (names an actual being, as Christians and Muslims do) that it is actually not like ‘yeti’ but like ‘square circle’ and that nothing can count as evidence for square circles, is harder work for ‘god’ than ‘square circle’ only because religious folk have been squaring the circle for so long! I reject Anthony’s assertion that God is not amenable to empirical investigation, since one can empirically investigate claims about how God interacts with the world. The efficacy of prayer is one of these. I believe Grayling is referring here to a deistic god, since theistic gods need not be “consistent with all evidence.” The existence of earthquakes, for example, is not consistent with a benevolent theistic god. I still maintain that if one claims that a god interacts with the world in certain ways, then those claims can be investigated empirically. To me the existence of a deity is not a matter that can be ruled out by philosophy or logic from the get-go; it’s a matter for empirical observation and testing. While I find this discussion interesting, I must admit that I don’t find it especially consequential. Even if the God concept can be made coherent, no remotely convincing evidence for the existence of a God has ever been offered, and there is no reason to expect it ever will (as Coyne would agree). The God hypothesis is dead. The existence of such an entity (certainly one that meets the description of any of our obviously man-made religions) is about as plausible as the existence of witches or the belief that suicide bombers really get 72 virgins in the afterlife. Furthermore: religious people seem to think that if God does exist, then it’s obvious that we ought to obey his every command — but that doesn’t follow. Whether God is a yeti or a square circle, nothing can absolve us of the responsibility to think for ourselves, and to rationally decide how we ought to live our lives. Posted by Ezra Resnick in Belief, Philosophy, Reason. When men have found some general propositions that could not be doubted of as soon as understood, it was, I know, a short and easy way to conclude them innate. This being once received, it eased the lazy from the pains of search, and stopped the inquiry of the doubtful concerning all that was once styled innate. And it was of no small advantage to those who affected to be masters and teachers, to make this the principle of principles, — that principles must not be questioned. For, having once established this tenet, — that there are innate principles, it put their followers upon a necessity of receiving some doctrines as such; which was to take them off from the use of their own reason and judgment, and put them on believing and taking them upon trust without further examination: in which posture of blind credulity, they might be more easily governed by, and made useful to some sort of men, who had the skill and office to principle and guide them. Nor is it a small power it gives one man over another, to have the authority to be the dictator of principles, and teacher of unquestionable truths; and to make a man swallow that for an innate principle which may serve to his purpose who teacheth them. Whereas had they examined the ways whereby men came to the knowledge of many universal truths, they would have found them to result in the minds of men from the being of things themselves, when duly considered; and that they were discovered by the application of those faculties that were fitted by nature to receive and judge of them, when duly employed about them. We shall not have much reason to complain of the narrowness of our minds, if we will but employ them about what may be of use to us; for of that they are very capable. And it will be an unpardonable, as well as childish peevishness, if we undervalue the advantages of our knowledge, and neglect to improve it to the ends for which it was given us, because there are some things that are set out of the reach of it. It will be no excuse to an idle and untoward servant, who would not attend his business by candle light, to plead that he had not broad sunshine. The Candle that is set up in us shines bright enough for all our purposes. The discoveries we can make with this ought to satisfy us… If we will disbelieve everything, because we cannot certainly know all things, we shall do muchwhat as wisely as he who would not use his legs, but sit still and perish, because he had no wings to fly. The next time you’re at a math-friendly party (or anywhere you don’t mind not being invited back to), ask one of the people nearby to secretly choose any two-digit number, cube it (he or she may use a calculator), and tell you the result. Watch your audience’s jaws drop and their eyes fill with admiration as you immediately name the original number! The cube root of 10,648? That’s 22, of course. How about 658,503? Why, it’s 87. I can go all night. You can deduce the tens digit of your mystery root by knocking the last three digits off of the given cube, and seeing where the remainder falls among the values above. For instance, if you’re left with something smaller than 8 (i.e., the cube is less than 8,000), then the tens digit of your mystery root is 1. If you’re left with something greater than 7 but less than 27, then the tens digit you want is 2. And so on — if you’re left with 729 or more then the tens digit you’re looking for is 9. What about the units digit? That’s even easier: it can be deduced directly from the units digit of the given cube. Notice that the units digits of the cube values above are all different — in most cases, it’s the same as the root number itself! The four exceptions pair up nicely: 2 and 8 map to each other, as do 3 and 7. So to put it all together: say the person you want to impress gives you the cube value 175,616. Since 175 is between 125 and 216, the first digit you’re looking for is 5; and since the cube value ends with 6, so must its root — 56 it is. Posted by Ezra Resnick in Philosophy. How does philosophy help us in our efforts to better understand the physical world (if indeed it does)? In an interview with Robert Kuhn at Closer To Truth, Daniel Dennett suggests that philosophers deal with questions rather than answers: “Philosophy is what you have to do until you know what the right questions are.” Once you’re clear that you have a good question, then you go off and try to answer it — and that’s not philosophy, it’s physics, or psychology, or history, etc. Back in Aristotle’s day, everything was philosophy: the boundaries between various domains of knowledge had yet to be drawn. As different questions eventually became clear and distinct, new fields branched off and came to stand on their own. Philosophy can help you see why certain questions, which are very tempting, are going to mislead you more than help you. Dennett points out that the history of philosophy is in many regards a history of mistakes — “very tempting mistakes, mistakes that very smart people are apt to be tempted by.” Only by studying and understanding those mistakes can we avoid repeating them. Philosophy helps to clarify issues, to raise questions, to articulate underlying reasons. Philosophy can help you see the forest for the trees. Posted by Ezra Resnick in Belief, Ethics, Religion. Religion is not only false; it’s immoral. One reason it’s immoral is because it’s false: holding beliefs for which there is no good justification is irresponsible, since actions guided by false beliefs often have disastrous consequences. Of course, even if one of our religions were true, that wouldn’t mean that all its precepts and commandments are moral: even if the Bible was authored by the creator of the universe, executing homosexuals and blasphemers and adulterers would still be wrong. The thought is frequently associated with Bertrand Russell: The worship of anything is beneath the dignity of a rational creature. That is, we argue that worship is immoral. Consequently, for any type of religious belief, if it requires one to worship anything, then it is intrinsically immoral. The argument turns on the claim that any conception of worship that’s worth its salt will involve the voluntary and irrevocable submission of one’s rational faculties to those of another. If there did exist a being vastly more intelligent, more powerful, and more moral than us (and the Biblical God certainly doesn’t meet that description), it might merit gratitude, admiration, respect — but never worship. And what kind of supreme being would want to be worshiped, anyway? Or glorified? Or obeyed blindly? The best humans we know never seek such things. Just like religious faith, worship is inherently immoral, and encouraging it causes much evil in this world — whether the object being worshiped exists or not. There’s always some human authority happy to step in and take advantage of the religiously cultivated inclination towards submission, obedience, and servility. 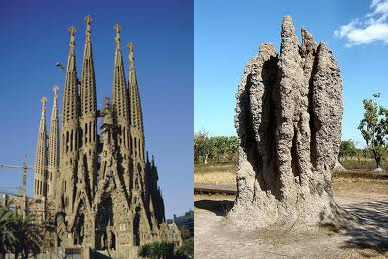 On the left, we have Gaudi’s cathedral in Barcelona; on the right, a termite mound. Both structures serve a purpose (or several purposes); and both exist, with their particular characteristics, for a reason. They are not the result of materials being thrown together randomly; it makes sense for us to ask why their features were built one way and not another. And yet, there is a crucial difference between the two. In a recent lecture at UCLA, Daniel Dennett describes the difference this way: There is a reason why termites build mounds — but it’s not true that termites have a reason for building mounds. Human beings have reasons for the things they do, and they can represent those reasons explicitly. But no termite needs to understand the reasons behind its actions — no one needs to understand them. Complex reasons can emerge from the mindless, purposeless, automatic process of natural selection. In the theory with which we have to deal, Absolute Ignorance is the artificer; so that we may enunciate as the fundamental principle of the whole system, that, in order to make a perfect and beautiful machine, it is not requisite to know how to make it. This proposition will be found, on careful examination, to express, in condensed form, the essential purport of the Theory, and to express in a few words all Mr. Darwin’s meaning; who, by a strange inversion of reasoning, seems to think Absolute Ignorance fully qualified to take the place of Absolute Wisdom in all the achievements of creative skill. Exactly! This “strange inversion of reasoning” was Darwin’s great insight: a new way of thinking, with profound consequences and explanatory power. Dennett attributes a comparable “inversion of reasoning” to Alan Turing. Before modern computers, “computers” were humans who performed mathematical calculations manually. To do this, they had to understand arithmetic. But Turing realized that it’s not necessary for a computing machine to know what arithmetic is. And so we now have CPUs, spreadsheets, search engines, all performing complex tasks without understanding what they are doing: competence without comprehension. This is the opposite of our own personal experience: our competences flow from our comprehension. But evolution shows us that comprehension can emerge as the result, not the cause, of competence. Just as life is ultimately constructed out of non-living parts, understanding can be constructed out of non-understanding parts. The individual neurons in our brain don’t understand anything — but we do. There must be a continuum, therefore, ranging from a complete lack of understanding to the kind of understanding humans have. Do apes have reasons? Apes fall somewhere in the middle between termites and Gaudi. They have proto-reasons. The same might be said of our more complex computing machines. One day, we will reach the point when computers have full-fledged reasons of their own. For billions of years on this planet, there was competence but no comprehension. There were reasons, but no one understood them. We have now evolved the ability to look back and see the reasons everywhere in the tree of life — reasons discovered by the same mindless process that produced us.